I think I’m already starting to look at every moment in my day to help motivate and encourage me to increase my fitness and healthy lifestyle. I even related my dream this morning to fitness, and maybe I’ll write about it soon, or even tonight, but what I want to talk about are my NEW TOYS! That I MADE MYSELF!!!! Aren’t they beautiful? When you look for medicine balls for performing wall balls or medicine ball cleans, you’ll find that most of them cost around $50-60. These two that I just made cost me a total of $25. The most expensive part was the pretty duct tape! I bought a couple of basketballs from a thrift store, cut holes in them large enough to fit a funnel into, and filled them with sand. I weighed them out to 15 lbs, and then covered the hole with tape and then wrapped them completely with the decorative duct tape. 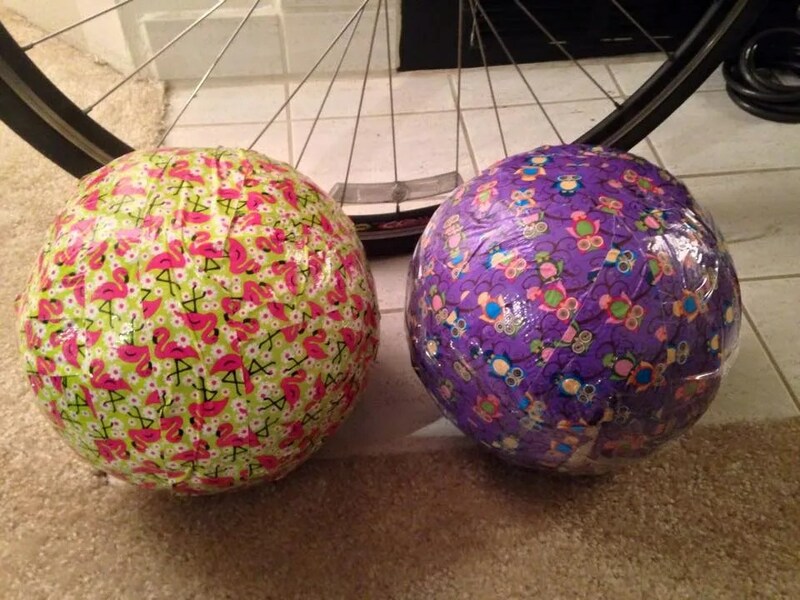 And Bob’s your uncle- homemade medicine balls. Now, I won’t be able to do any ball slams with these, or try to throw it overhead, but it’ll be perfect for Russian twists, partner passes, or a stabilizer for floor wipers. I’m sure I can think of a few other fascinatingly wonderful exercises to use with these also! Can’t wait for Monday’s zoo Bootcamp!